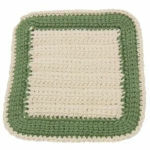 Daisy Bright Hot Pad -- $1.99 A Crochet pattern from Julie A Bolduc. This hot pad as will all of my CD hot pads can also be a potholder by leaving out the CD. This bright and sunny hot pad will brighten up any kitchen.